Get ready to see stars, planets, the Moon, and interesting deep sky objects. Park entry fee is waived for this event. You must enter the park before 7:30pm. Public observing will start at 8:00 PM and last until 10:30 PM. This event is being held inside the fort walls! All vehicles will be parked in the visitor center parking lot and attendees will make the short walk into the fort’s parade ground. There are restrooms at the visitor center. You may wish to bring a RED flashlight for walking around the grounds. Red shielding tape for flashlights will be provided if needed. Consider bug spray in case it is required, but be mindful of any insecticide overspray that may reach telescope equipment and apply in another location. All NEFAS volunteers bring their personal stargazing equipment and will instruct guests how to look at the celestial objects safely without damage. Adults may need to assist children. If you are considering purchasing a telescope this is an opportunity to examine several different types and sizes of telescope – ask lots of questions! If you are having trouble with your own telescope, bring it along and one of our “Telescope Doctors” will take a look at it. Sometimes cloudy conditions make it unfeasible to stargaze. 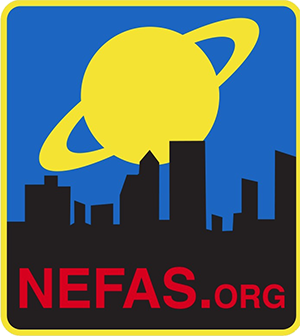 In the event that weather conditions cause NEFAS to scrub this event, you can find that information on our website main page [www.nefas.org]. We recommend you check the website before leaving for the park. Every attempt will be made to post a “no-go” message by 5:00 PM prior to the start of event night.